Pilotdog68 showed by starting the " what did you mod today" thread almost 3 years ago that modding was not dead on BLF but very much alive. That thread made me post more mods than I did before because a whole new thread was not needed now, many mods were not worth more than a quick post with one or a few pics and this thread is perfect for that. But since then I also do not post many comprehensive mod threads anymore, the WDYMT thread made me a bit lazy. So to compensate somewhat for that here's a very complete mod thread once more. 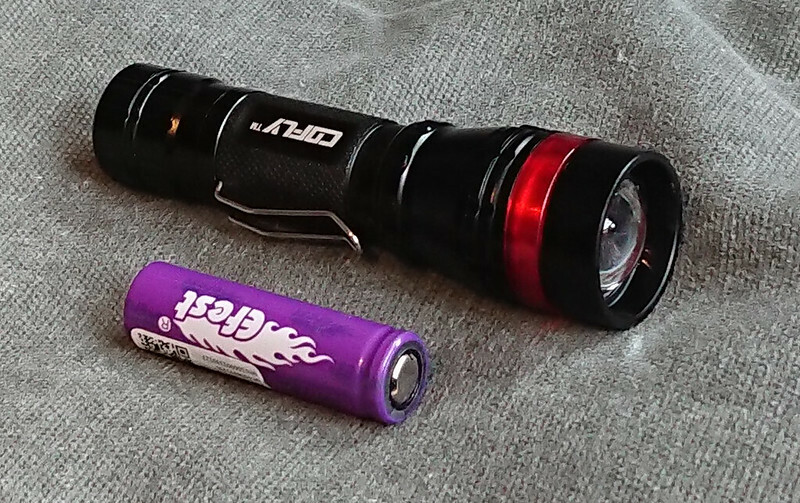 I chose a cheap under 10 dollar zoomie that unfortunately is not for sale anymore, unfortunately because the build quality is not bad and it has a nice 21mm diameter (plastic) lens that makes for some decent throw considering the small size of the flashlight. 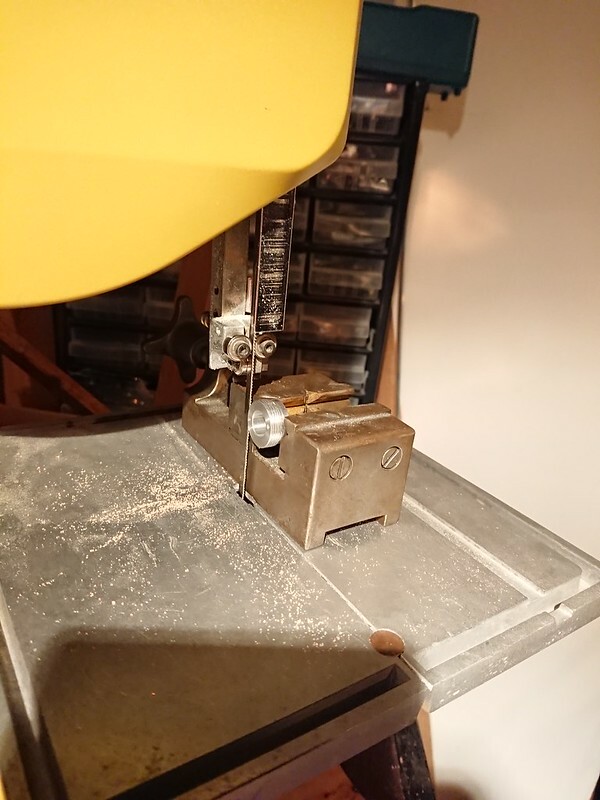 In this post I show many ways-methods-gear-parts that I picked up on BLF or developed myself, but in no way what I do here is how it should be done, there's many ways to do stuff and other modders have their own methods and specialities. But perhaps it does help people to see how someone else does things. 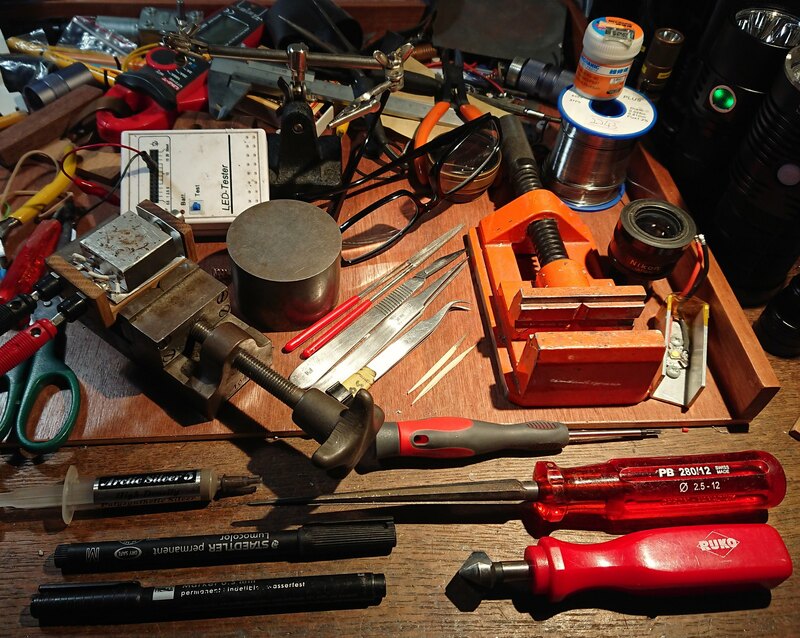 Some of the things in the photo: reamer, metal-grade countersink tool, heat block, round iron block with very flat upper surface (used as sanding base to flatten things), diamond files, tweezers, toothpicks, aluminium vice (alu=nice&grippy), test XM-L2, Nikon eyepiece used as a loupe, 63/37 rosin core solder wire, 63/37 solder paste, small cutting pliers, piece of a projection lens (=used in front of phonecamera to make macro-pictures), +4 reading glasses for close-up work, helping hands for soldering, led tester modded with clicky switch (instead of stock momentary switch), clamp meter, calliper. 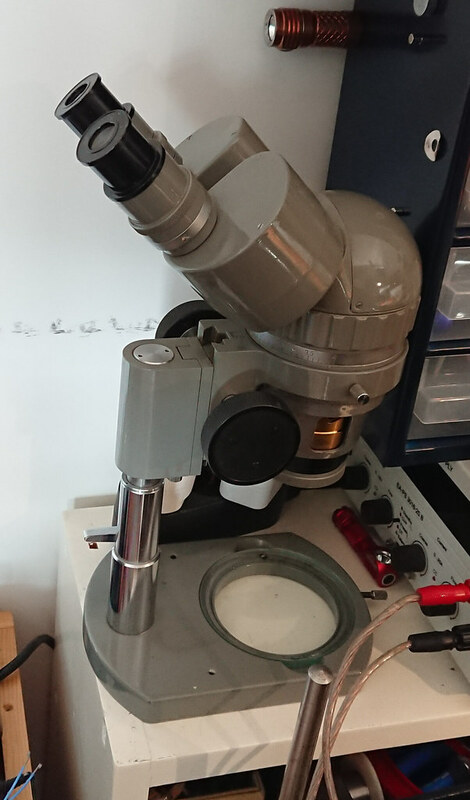 Oh, and I forgot this very often used thing, my 20x-80x Olympus zooming stereo microscope. 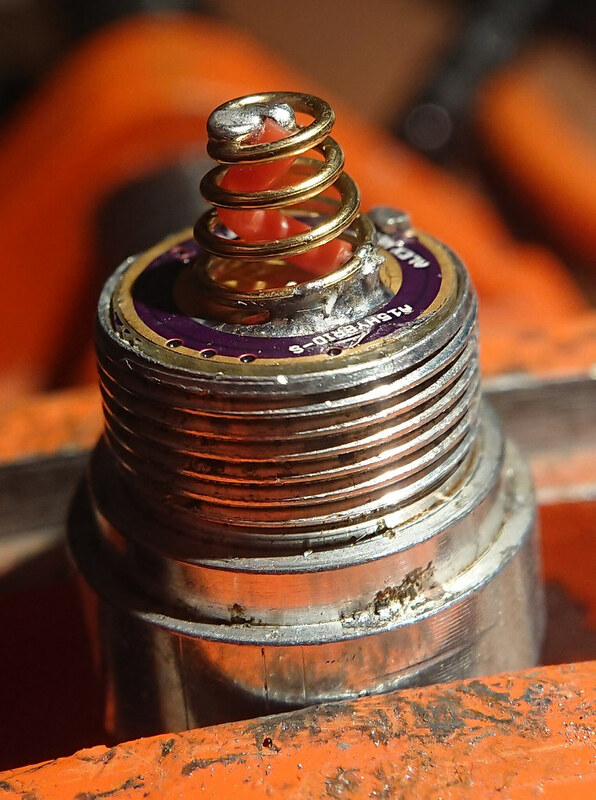 To check things, to work through for tiny mods, and for making very detailed macro-pictures. 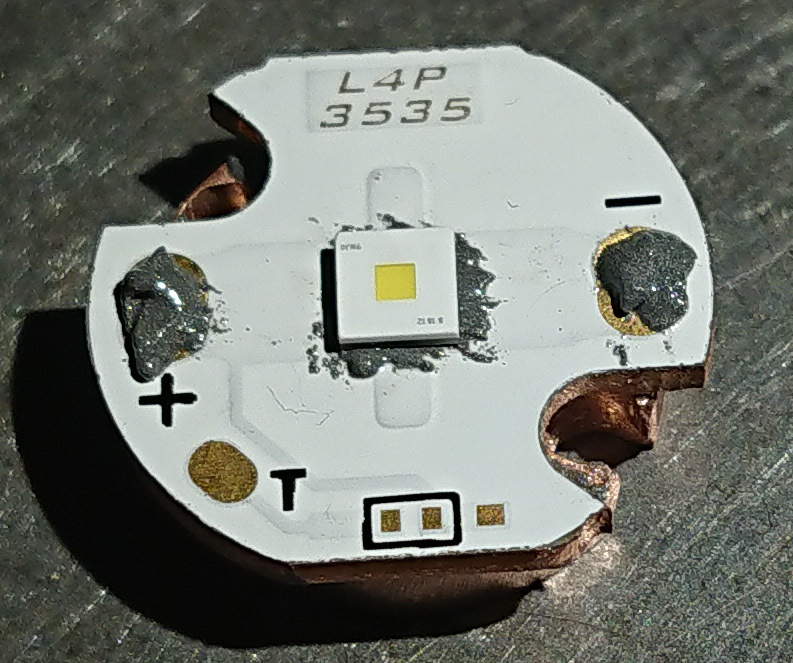 This zoomie has a hollow pill and although normally when using a copper DTP-board that is no problem for the heat path, with this led at close to 5 amps some extra measures are needed, I decided on a little chunk of copper under the ledboard. The assembly fitted tightly in the pill, but only in one orientation (pill=not perfectly round apparently ) I marked the working orientation with a sharpie. 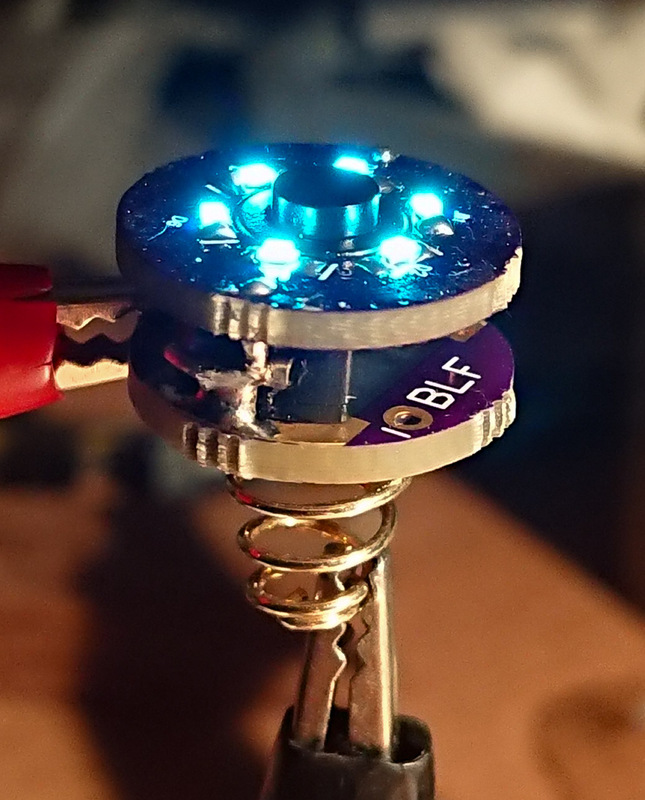 I tested with the led-tester if all worked without unwanted shorts to the pill. 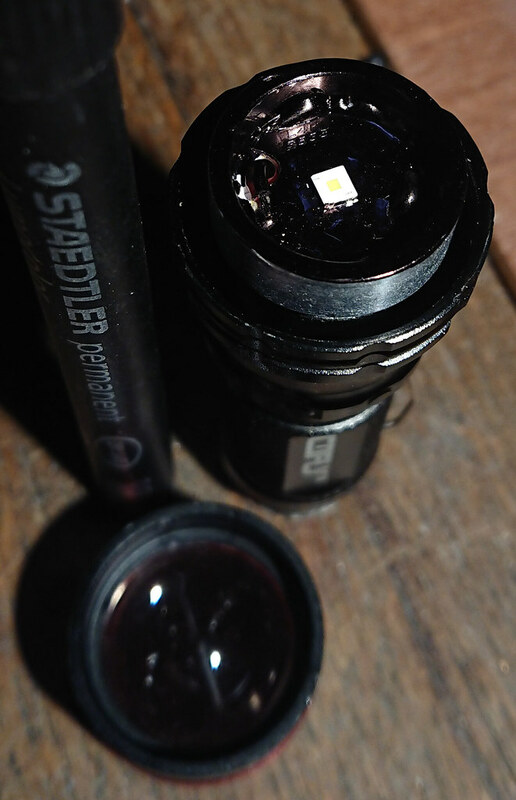 I decided on a BLF-A6 FET+7135 driver, but leave enough resitance in the flashlight to not overdrive the (very low voltage!) Osram KW CSLNM1-TG led. 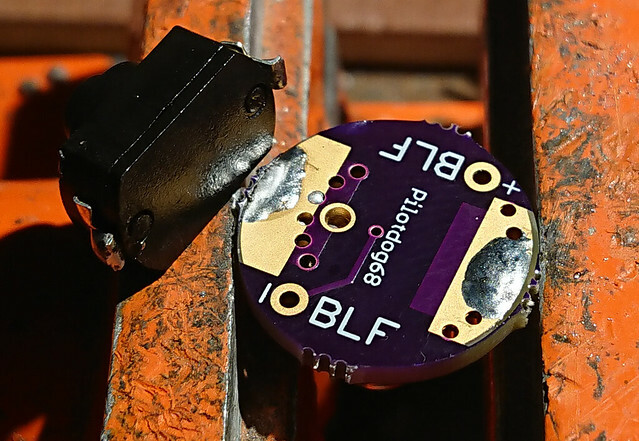 The BLF-A6 driver is a 17mm driver and can not be sanded down to 15mm for this flashlight, but WarhawkAWG a few years ago had made a 15mm version of wight's FET+7135 driver (Oshpark link) that works well with the components unsoldered from the A6 driver, except the FET is too large and should be replaced by a smaller LFPAK33-package FET (bought from Mountain Electronics some years back). 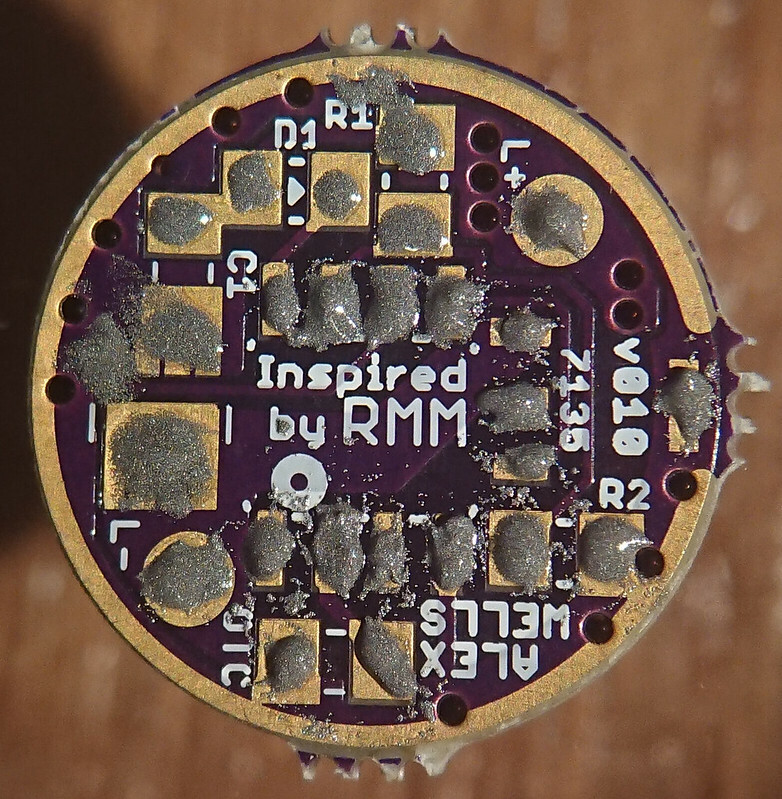 solder paste was applied on the new board. 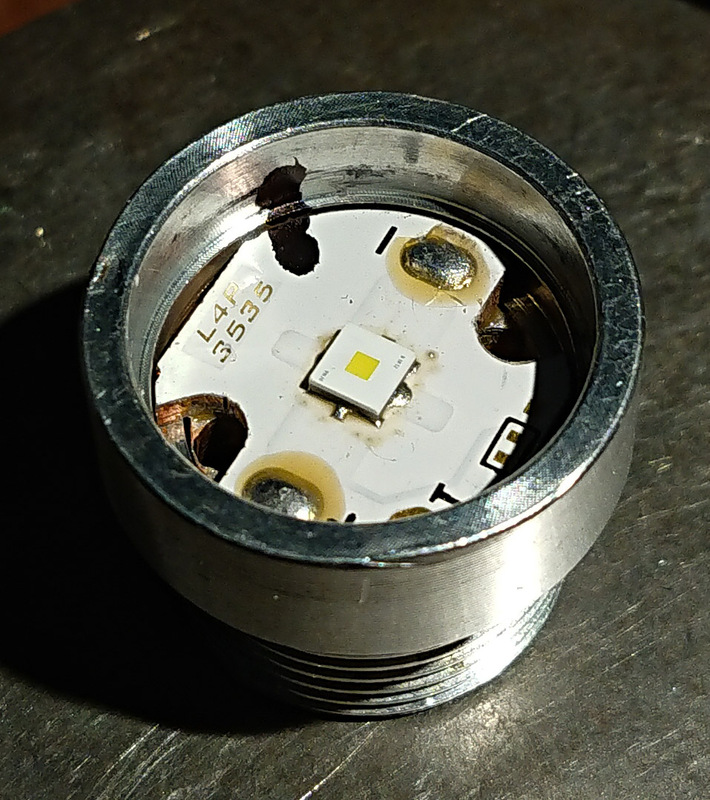 The yellow BLF-A6 board was put on the hotplate and the components one by one transferred to the 15mm board (except the FET, that came new). 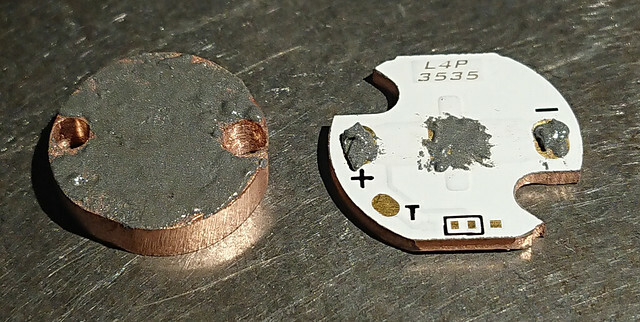 and the result was filed in shape so that the component side of the wire pieces was kept very flat, and the side was sticking out a bit to clamp in the driver cavity of the pill. 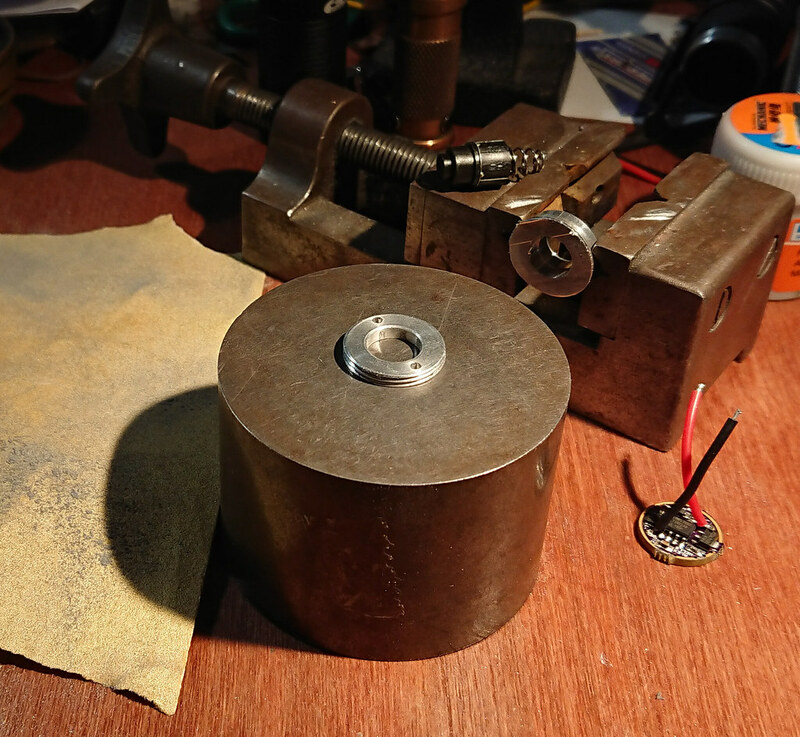 I forgot to add a bleeder resistor to the driver (the flashlight will have a lighted tail), so I drilled a shallow hole (dia2,5mm) on the battery side and crossed the ground ring and batt+ pad with a 680 Ohm resistor. I do not trust the stock switch very much at high current, and also I wanted to do a lighted tail. So the stock tail on the right must go, and it must become one like the one on the left. The height seems about correct. 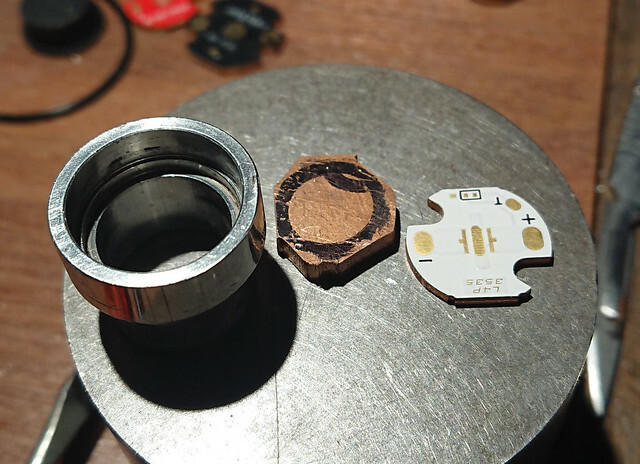 But the switch assembly like on the left needs a retaining ring and there is none for this specific flashlight. 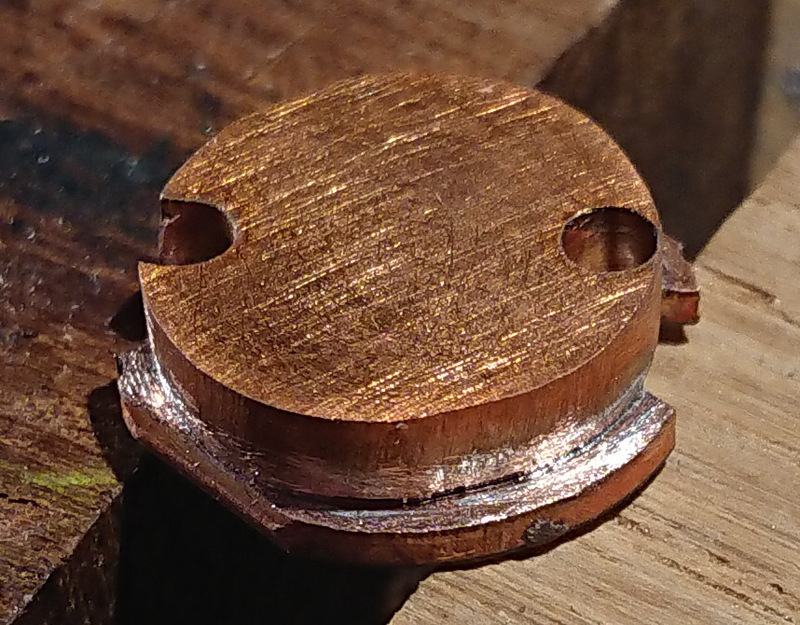 So I made a retaining ring out of the original switch. First I pushed the switch out of the aluminium holder. Then a pieces containing the threading was cut off with the band saw (a hack saw would have worked just as well). 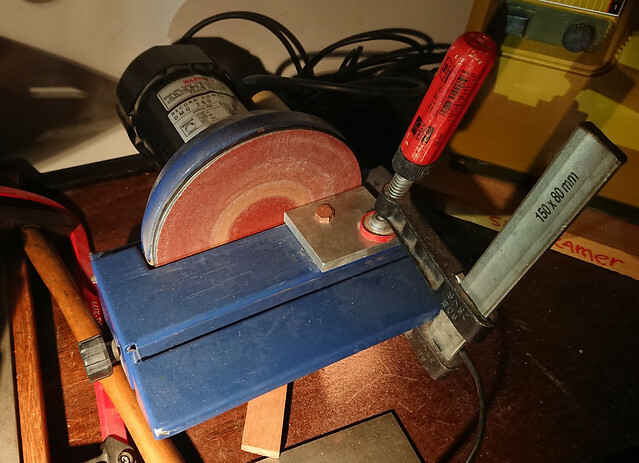 The cut-off piece was sanded flat with sand paper (on the flat iron block) then the inside that was way too narrow was reamed a lot with a hand-reamer. 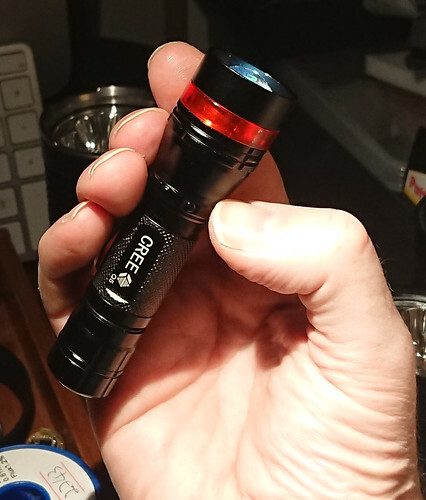 For grip on the piece during reaming, it was screwed into the tail-section of the flashlight that was held firm in the hand with a piece of rubber inner tire. 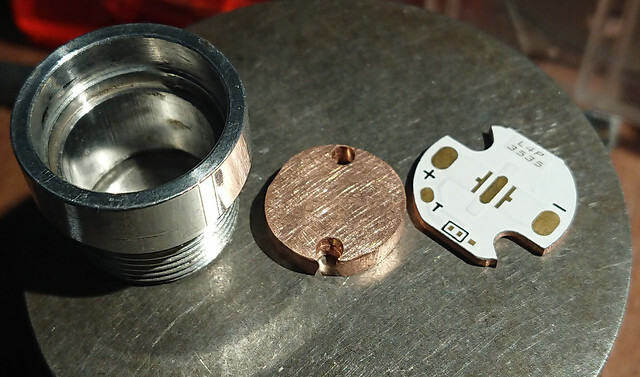 The inner edges were bevelled with a countersink tool. 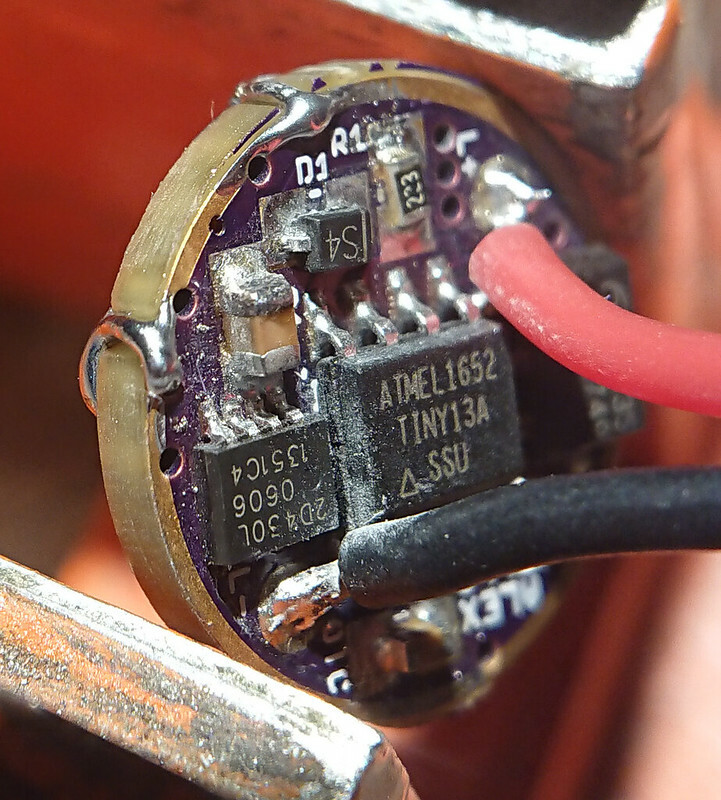 An Oshpark tailboard by pilotdog68 (link later) was used for soldering the switch (Omten 1288) and spring. 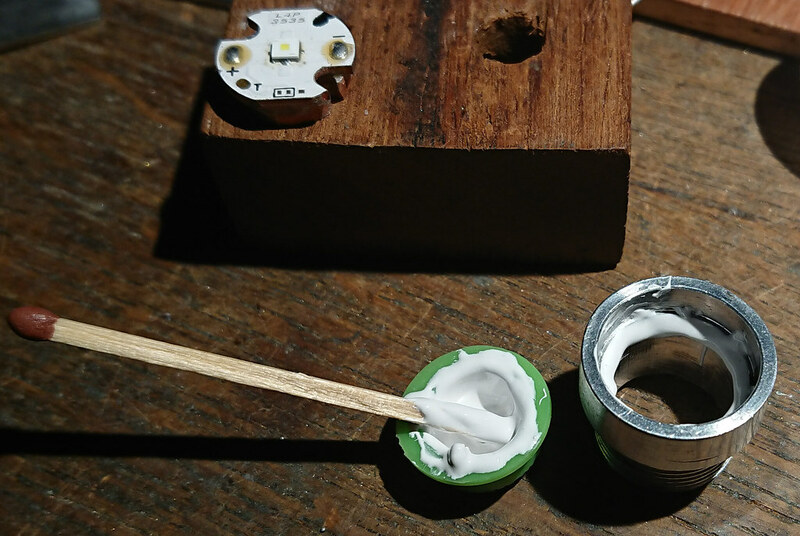 I always pre-tin everything, then fuse with the solder iron. In case of the switch I solder very fast, to prevent melting the inside of the switch and kill it. 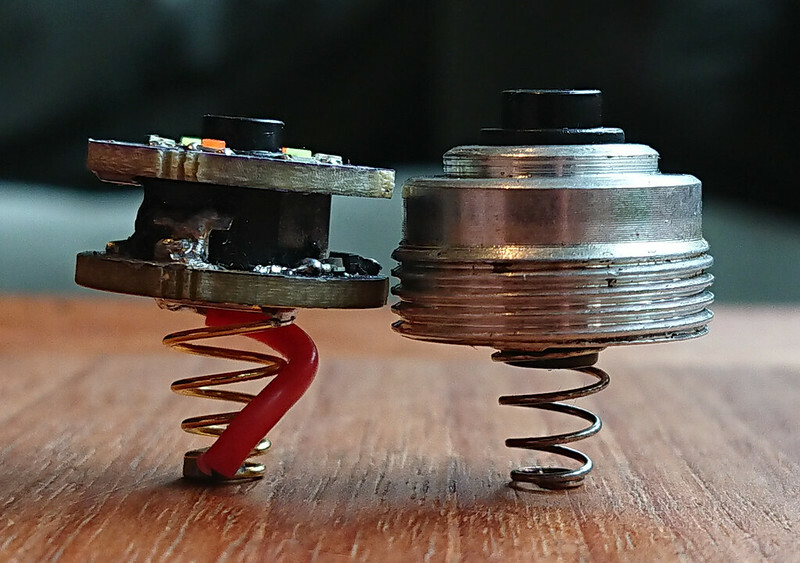 Also, the spring is soldered first before doing the switch, so that the heat from the spring soldering can not kill the switch. 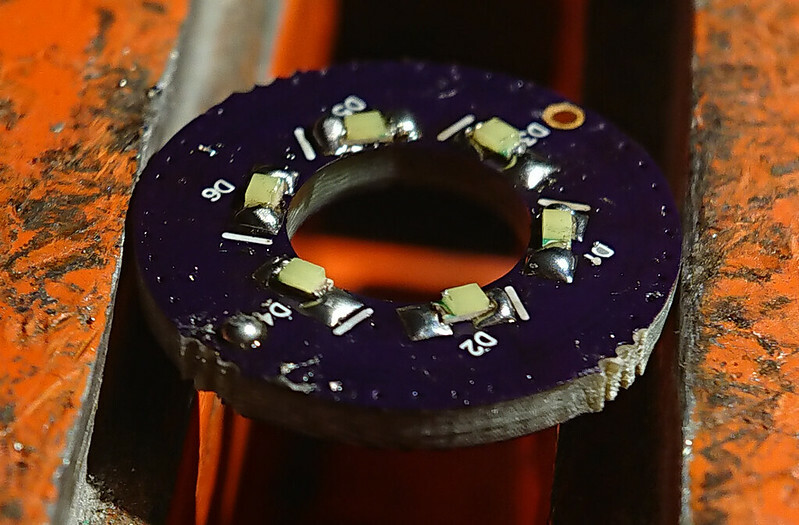 I had a few tail leds fail over time and I think it helps if the soldering is good. Although the new ledboard is thicker than stock, the focus of the beam in spot modus was correct, so no lens height adjustments were needed. 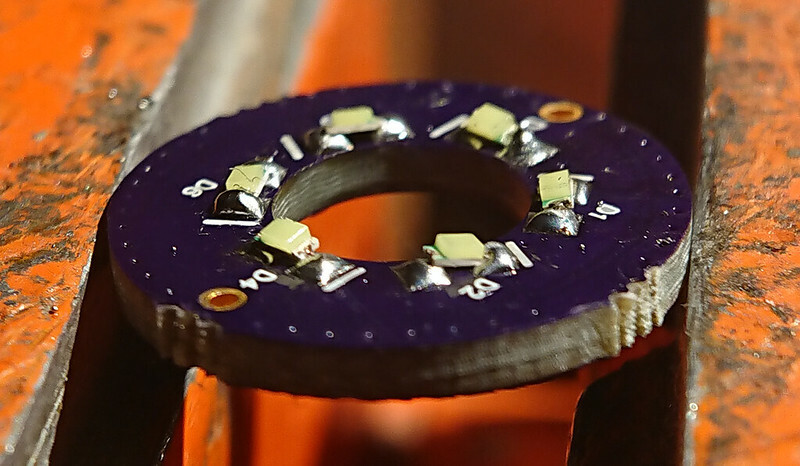 I had chosen the bleeder resistor value and tail resistor values well so the user interface was not messed up (I chose the BLF-A6 driver and not the X5/X6 driver because it is less critical about that). I measured output without tail with a clamp meter and got over 6 amps. With the flashlight on the highest setting the light was clearly getting a bit blue. 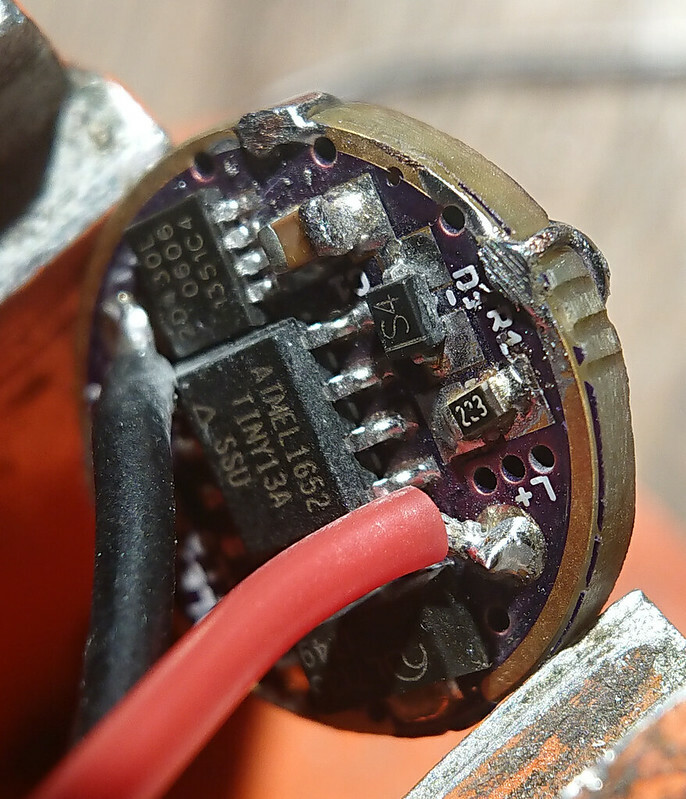 Even with the extra resistance of the tail the current was too much, so I removed the spring bypass on the driver. Then there was no blue shift of the tint anymore. 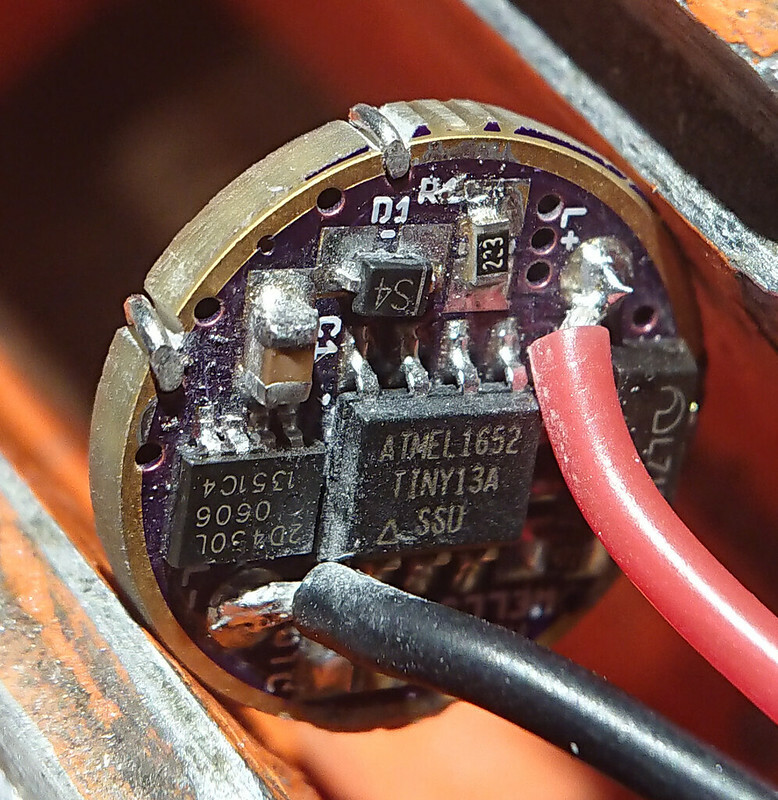 The output zoomed out on a purple Efest 14500 is 400 lumen, zoomed in 170 lumen. The throw with the driver spring bypass still in place was 68 kcd (measured at 30 seconds on a full battery), with the bypass removed it was still 65 kcd and I reckon the current is now just under 4 amps with the battery full. 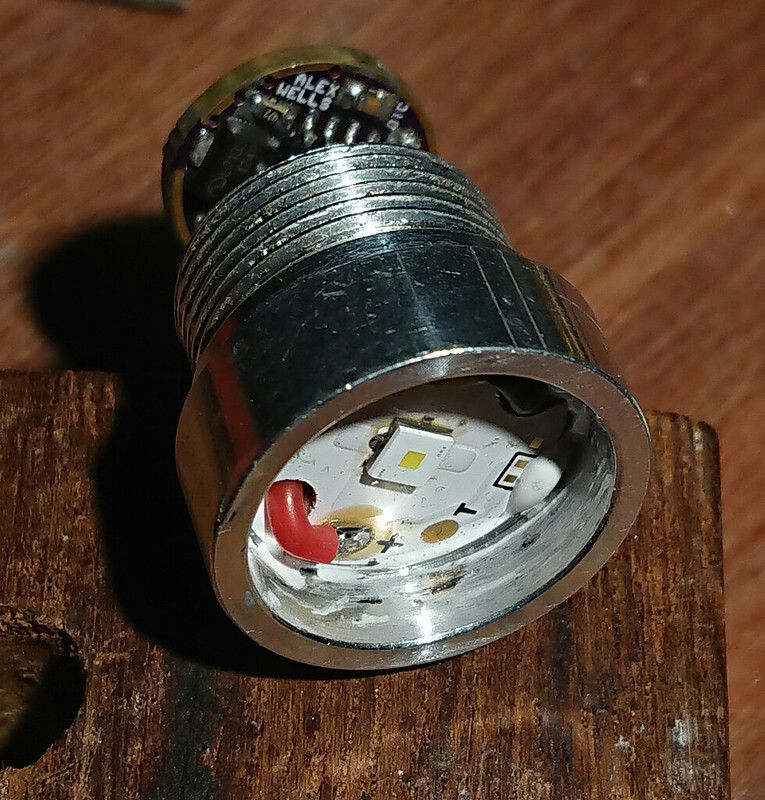 Much better for this small light, but still it gets hot pretty fast, the build-in stepdown of the BLF-A6 driver after 40 seconds is much needed (and adequate). The beam is plain white (unlike beams of dedomed XP-G2's) and zoomed in very very square . You can see vaguely the die pattern, especially on low modes. I hope this post with the many pictures and video's was fun to read. I may still edit it here and there in the coming days, or add even more pics. Outstanding. A lot of pics sez more than a thousand words. A lot more. This is the Gold Standard for a fairly complex mod. This is the way it should be done. Great detail, great skillz, and IMO great for BLF period. Thank you, it is quite awesome indeed, and usually I only find out how good these lights are that we make much later when I actually take it outside on a trip somewhere (I’m a city person). Thanks a lot, but I hope that my shaky hands are not considered as a golden standard. I do not think that way I do things are the standard way, other modders have other ways, but I do try to pay attention to details. When I started modding my main concern was a working flashlight. 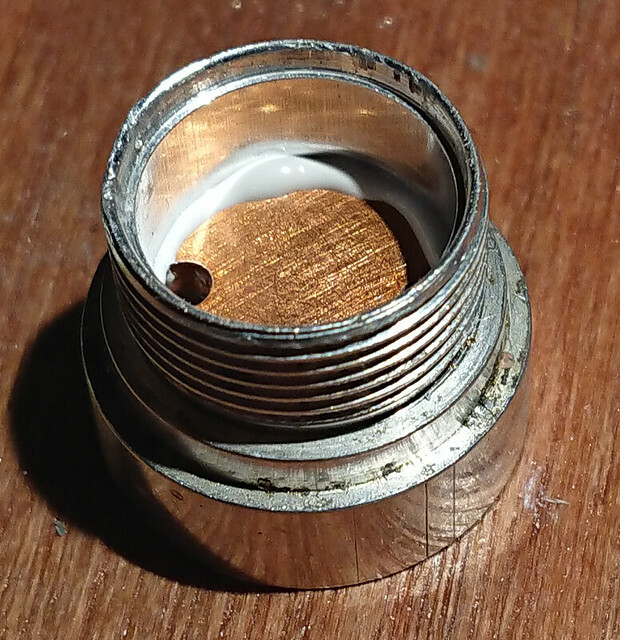 My earlier mods often failed after a while because of sloppy work. What I meant here is not necessarily that your methods of modding are a Gold Standard but how you explain what you’re doing through the use of great pics and precise verbal detail so that it’s very clear from novice to pro what, why, and how you did it. That is the Gold Standard IMO. When can I expect my new light ? 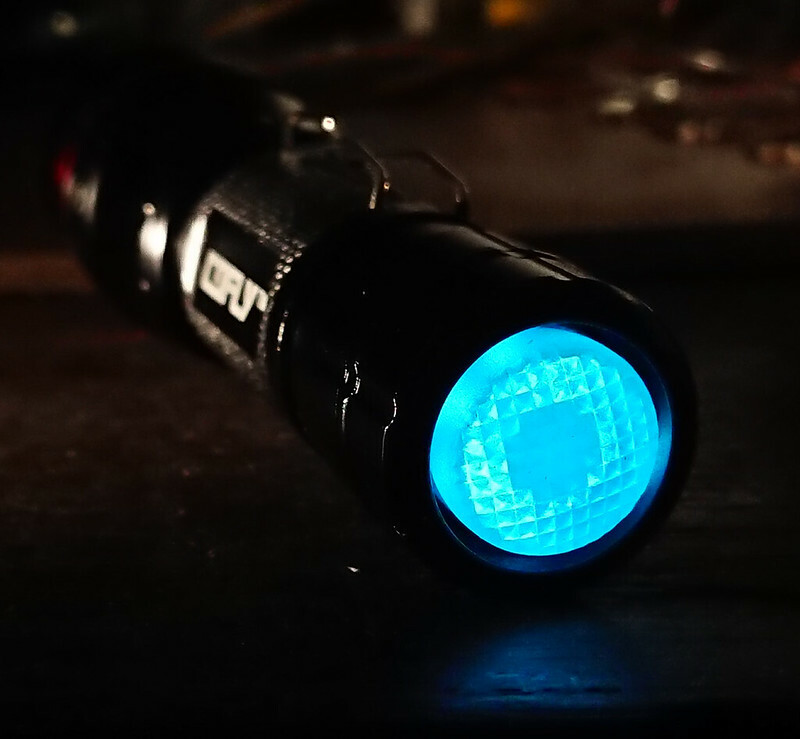 A working flashlight is always a good thing when modding. 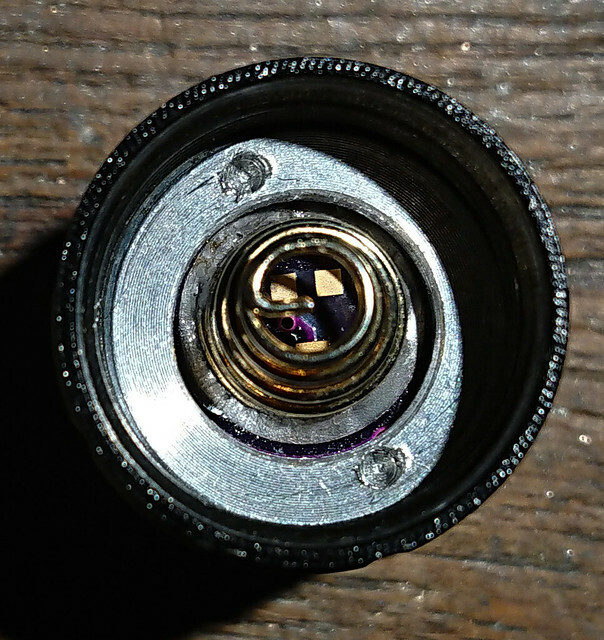 Nice write up on a nice mod. Thanks as always djozz. I put amber emitters in several of these a few years ago with great success. But now I feel challenged to improve them further. Is the Cofly 14500 model still for sale anywhere nowadays? I think I bought their three-for-about-$6-apiece deal, after searching for the product name various other places. 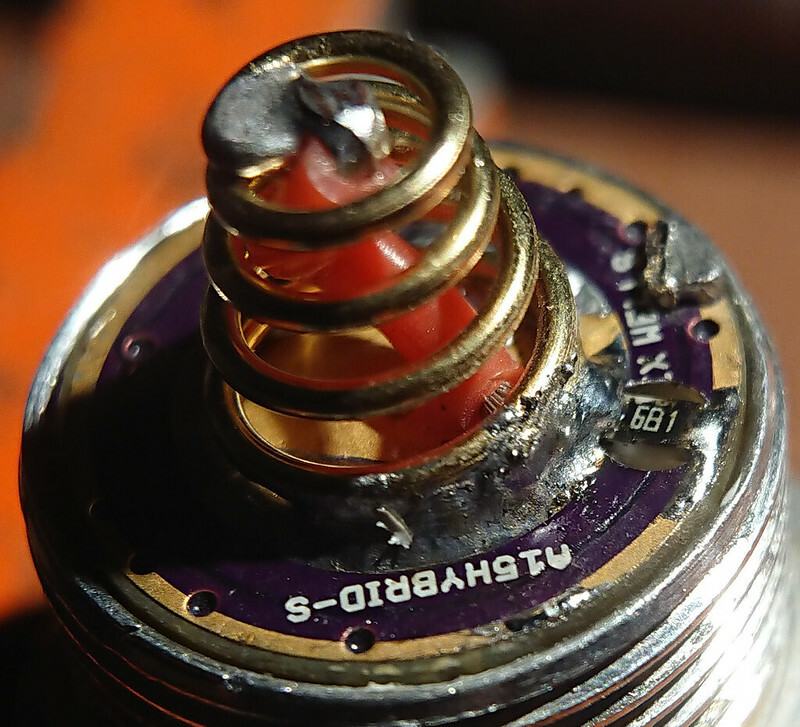 Yes, my soldering is not brilliant (but it is adequate for what I do). 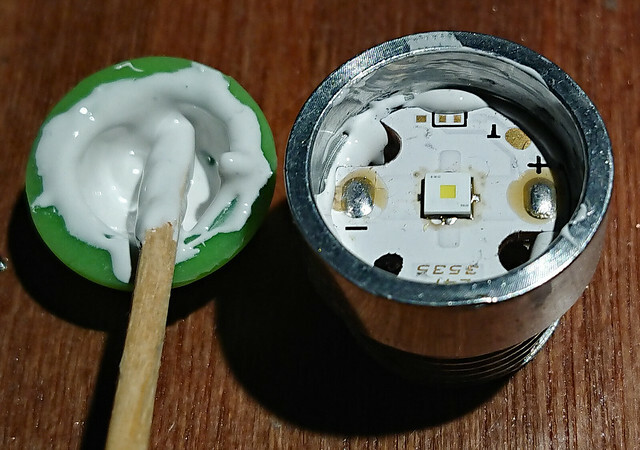 I need better solder paste too, this stuff leaves a sticky gooey around the solder blob. 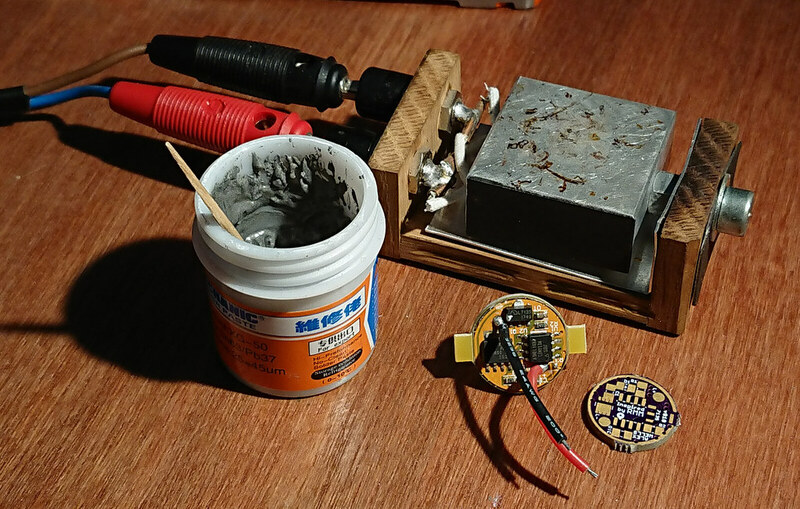 Edit: you make me think: I use the 25W solder iron for most things nowadays (and a 80W one for brutal stuff), but I do still have my old 18W iron around in a box, I should keep that one at hand too for fine stuff. It is out of stock at dx, as it is everywhere. Got any beam shots of this bad boy? You are right of course, I will try some! 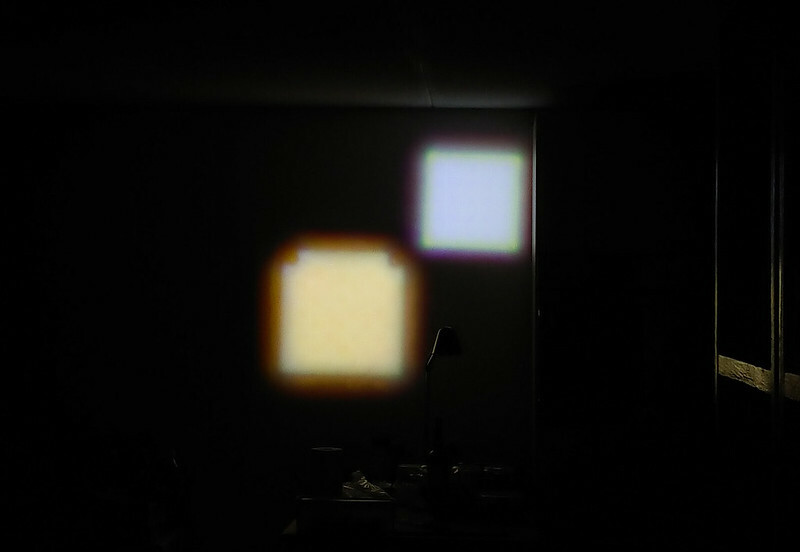 djozz, is there any possibility to show this light zoomed in to see the distance it reaches (more or less, of course) in external environment? 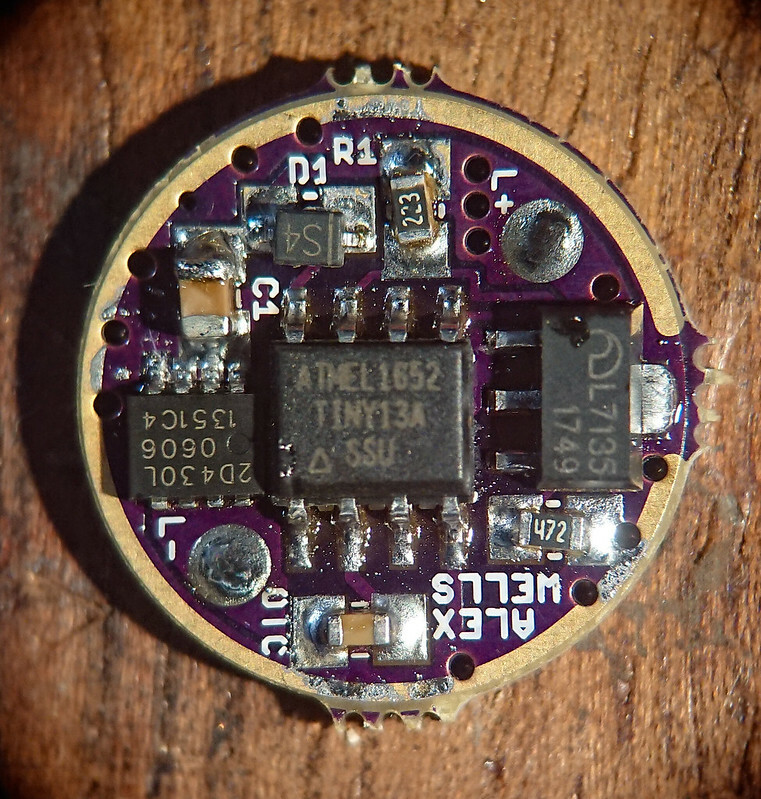 I don’t know this led but I am thinking about modding a zoomie with Led4Power LD-A4 3A driver (eventually 4A? Or would it be too much for a 16340 cell?) and wanted to check if it is much better than a XPL-HI 1A led in terms of beam and throw/distance!! Any clue on these options is also much appreciated! !